Back in the office and the Intranet Now conference already feels like a world away. Where to start? As Martin White has already said in his write-up, how do you sum up a day with *such* a packed agenda? Organised by Wedge and Brian, Intranet Now is a great opportunity to share best practice, learn from others’ mistakes and meet potential new friends and intranet partners. Wedge kicked off the day calling it “the only party where everyone knows what your job is” – when I attended last year it was amazing to meet so many intranet experts in one place! With a number of lightning talks and presentations there was a lot to take in throughout the morning – Brian pointed out, pointedly that everyone should take the opportunity to ask speakers questions during the afternoon! As Platinum sponsor, our Paul gave a keynote presentation, and Andrew and Billy led a workshop, as well as hosting a table on the important (and sometimes difficult to access) topic of accessibility. 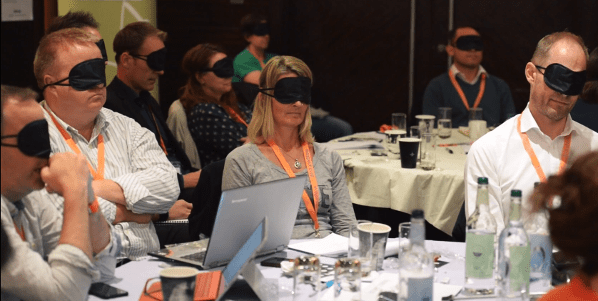 During Paul’s talk, everyone in the audience was asked to put on a night-mask, so that they were able to listen to the experience a visually impaired person might have when trying to access the internet to buy a greetings card. The fact that most people in the room put on their masks to participate was a testimony in itself for the positive, constructive environment. The tension in the room was palpable, before the audio kicked in. If you’ve never heard a screen reader in action or want to know more about accessibility, take some time to go through Paul’s presentation. If you’re able to get support at a senior level, it will help you prioritise making your digital workplace accessible for everyone, although getting buy-in from as many people (at all levels) as possible helps make sure accessibility gets, and stays, on the agenda. A question that came up a few times – how do you start? If you already know any users with accessibility issues, they may know others and already have a community. If not, use all the channels you have to ask for referrals and volunteers to help join a focus group. You can make your intranet more accessible – and that makes it easier to use for everyone! Use the formatting options available to you in your web editor. Watch out for bold/using colour to emphasise text – use headers instead. Be sure to use the bulleted or numbered lists. Make your content easy to understand – using tools like Hemingway can help you write more clearly. It was fantastic to see so many familiar faces, and so many new ones – at several points throughout the event it was standing room only. There was a real buzz to the day – in particular (and I know I am obviously biased) after Paul’s presentation, I spoke to several people who, like me, had been aware of, and even run training on making your content more accessible, without ever actually hearing what a screen-reader sounds like!